Iceland, and the Most Magical Day. 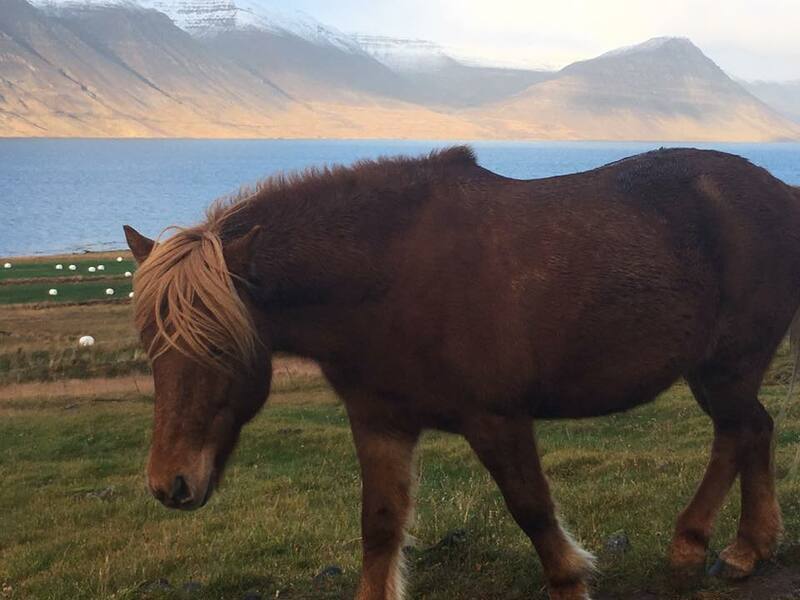 Bethany Abrahamson tells the story of carrying her father's ashes on a magical walk in the Westfjords of Iceland in this blog post by InTheKnow Tarot LLC, a business located in Appleton Wisconsin USA that provides tarot readings and numerology consultations. It was October 14th, 2017, our second full day in Iceland, our first full day in the Westfjords, and we’d just spent our first evening at our AirBnb. After being awake for nearly two days straight, my friend and I slept in until 10am. It was glorious. Immediately upon rising we looked out our window, and saw large sloping mountains surrounding us. There were tiny specs dotted along the bottom edge, which we later discovered were free-grazing Icelandic horses. To the right lay the open Atlantic. On the other side of the fjord rose another formidable mountain range, it’s peaks freshly dusted with snow. We went downstairs for breakfast, and we were greeted with an incredible spread of food. They provided Icelandic bread (which has ruined all other breads for me), fresh tomatoes and peppers from the greenhouse, a variety of fruit, a wide and flavorful variety of Skyr (a kind of Icelandic yogurt), cereals, an assortment of traditional meats, gourmet cheeses, fresh butter, cream cheeses, jellies, a curried spread with herring, caviar, and my most favorite offering of them all: fresh smoked Atlantic salmon that had been caught right outside in the bay. In the background our hosts played an Icelandic radio morning show where we heard a wide variety of music from classical to more modern pop tunes. (We tried hard not to giggle aloud upon hearing a Nordic version of "Gangsta’s Paradise.") Downstairs we could hear their African Grey Parrot, Heidi, happily chatting away and mimicking Icelandic words. The house was warm, cozy, and inviting. The ambient sound surrounding us was pleasant and soothing. It truly felt like a home. Those little dots at the mountain base are Icelandic horses. Our host, Árni, suggested to us that we take the hiking trail out to the point of the peninsula. It was 7 kilometers round trip (around 4.5 miles). He brought out his map and pointed out landmarks along the way- the stream we’d have to cross, which ways the land would slope, and the final rising hill which would suddenly reveal a lighthouse at the very end. He added "At the end of the peninsula is a perfect spot for whale watching." We were sold. What I didn’t share with my host was I had brought along a small portion of my father’s ashes to take along on an oceanside hike when the opportunity presented itself. My father loved going places, he always wanted to come with me on trips, and back in his healthier days he loved hiking in the wild. Arni’s advice gave me the hunch I may have found my moment, so I slipped the ashes into my coat pocket, and off we went. The trail, just like the mountain road, was casually carved right into the mountainside. It wound it’s way up and down, high above the shoreline and back down again, at times so close we could reach over and touch the ocean. The weather changed constantly, as did our views. From sunny streaks through the clouds which warmed everything, to a cold drizzle and strong winds that sucked all the heat out of you, the mood of the landscape was in a state of nonstop shifting. All the while, the mountains loomed over us, seemingly directly overhead. The stream Árni spoke of was wider than I anticipated. He said we could either hop across on the larger stones, or take our shoes and socks off to walk on through. Being flat-footed and possessing deteriorating equilibrium, I first attempted the barefoot crossing. This was quickly aborted when I lost feeling in my feet after just 10 seconds! Luckily my friend was more sure-footed, and she helped me cross. The stream was fed by a waterfall, so we filled our water bottles from the babbling brook (as is encouraged by Icelanders), and we enjoyed drinking some of the freshest tasting water in the world. Soon we came upon a large upward climb. This had to be the final rising hill. We worked our way over the top, waiting to see the lighthouse suddenly appear from nowhere. After a few more steps we spotted it on the hill below us: a little, two-story, blaze-orange lighthouse with just enough room for a few people. As we approached the lighthouse, the landscape seemed to open up all around us. The ocean water expanded into another large fjord to our left, and we were surrounded by ocean on three sides. We could see the tiny coastal village of Bildudalur nestled in-between two sharp-angled, flat-headed mountains. The valley behind the town was lit up with sunshine, as the clouds had parted just enough to flood the entire valley with a golden white light. To the right the sky was a deep periwinkle blue, filled with rain. The clash between the southern sunlight and northern rain began casting brilliant and vibrant rainbows. Oh Iceland, you sure are a stunner. The only thing missing were the whales Arni had mentioned, but my awe was no less diminished by their absence. I was already on sensory overload. I was staring into the face of a stunning subarctic paradise. Dramatic views in every direction. My friend stepped away to go explore a sea cave. I reached into my pocket for the small container of Dad’s ashes. Almost in response, the clouds opened up even more, and the sunlight cast thick streams of golden light over the entire southern fjord to our left. "Oh yes," I thought, "my father, lover of the wild, lover of complete solitude, lover of lighthouses and maritime culture (not to mention seafood), would have been most pleased that I brought him here." I breathed deeply, and said a few private words to Dad. This was the first time I’d allowed myself to really think about the profoundness of carrying my father with me on this trip, so my words nearly sat in my throat as I choked back emotion. The entire moment was surreal. Sorrowful, but beautiful. Peaceful. In the absolute solitude of the moment, I unburdened myself. I wailed into the wind, succumbing to cleansing tears of grief. Oh Dad. "How I wish... how I wish you were here..."
Just as I pulled myself together, my friend reemerged from a steep cliffside path, much to my relief (it was quite steep, and I’m such a Cancerian worry-wart). As we walked away, I felt a rush of euphoria mixed with grief and release. I had "shown" my dad the view of a lifetime. We knew we had just experienced a magical moment. What we didn’t know was the magic was only beginning. During the 1 1/2 hour walk back to our AirBnb, we were surprised with many more rainbows. They almost seemed to follow and chase us. Not just single rainbows, but double rainbows. They manifested instantly and so brightly, our cameras couldn't truly capture their radiant beauty. As quickly as they appeared, they faded and reappeared again, leaving us completely enraptured with the seascape. One of the many rainbows. For perspective, I’m that tiny black dot on the beach. We saw more than ten rainbows that day. The clouds began to thin, and blue sky started emerging. After 45 minutes of being awestruck by rainbows and brilliant lighting, my friend gasped, pointed into the fjord, and exclaimed "Whale!! Whale! Over there!" I scrambled over quickly, desperately searching where she pointed. There was a disturbance in the water, but I couldn’t see for certain what it was. Then, and as if on cue, another rainbow appeared, it’s left end-point diving straight into the fjord. In less than 10 seconds, it evolved into a double rainbow. Between the two rainbows, there the whale resurfaced- and there it stayed, resurfacing repeatedly for over 15 minutes. I stood in utter disbelief. Here I was, 42 years old, seeing my very first wild whale after a lifetime of longing and literally dreaming of this very opportunity. And here it was- while I was taking my father "for a walk." It was kismet. The whale was submerged just below the surface, between these two rainbows. After a time we began walking again, but our eyes remained fixed on the fjord. After a few more minutes, the whale disappeared into the horizon. 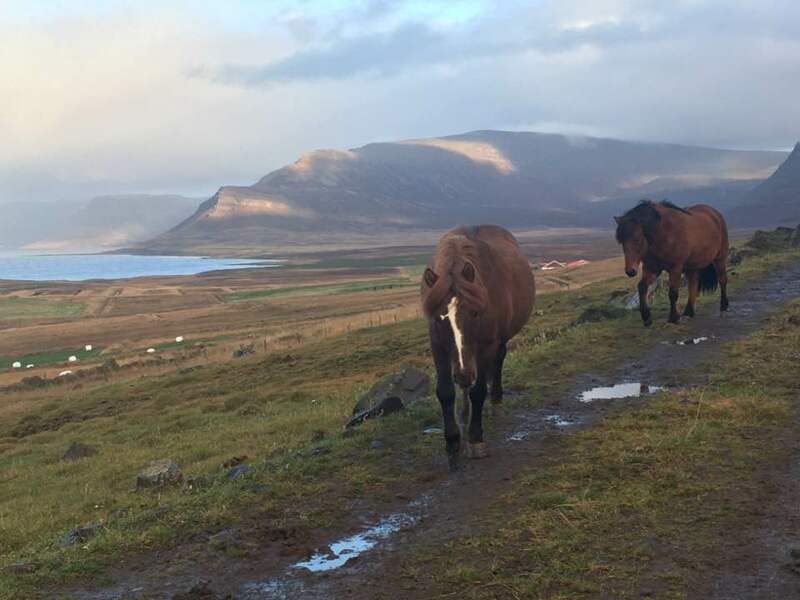 Shortly after it left us, we met the first fellow living souls on our hike: four Icelandic horses, taking themselves for a walk down the trail. They slowly and gently approached us, accepting our nose rubs, until the jealous alpha female pushed the group away from us, which gave us a hearty laugh. Well. Hello there, Lady Alpha. Don’t mind us. You have right-of-way. Upon our return we were greeted by our hosts with a generous and delicious traditional Icelandic meal consisting of cauliflower pie, braised lamb, caramelized potatoes, red cabbage, and peas and carrots- a very special treat, considering our hosts only advertised serving breakfast. We shared the meal together with a Canadian family and two young men from Singapore. We laughed and shared stories about cultural discoveries and differences, things to explore in the area, world politics, and other varying topics. Toward the end of the meal, Lilja, our other host, told us they would be closing down their AirBnb on the 22nd because balancing farm life and hospitality was becoming too much work. I felt saddened, knowing I’d never be able to come back and share this magical place with my husband, but I also felt incredibly lucky. We were so fortunate to find this little slice of AirBnb paradise during its brief window of existence! After finishing dinner, our hosts told us to prepare for time in the hot tub, because the Northern Lights were sure to come out. Just look at the light on those mountains. In the dark and brisk cold, my friend and I sprinted for the hot tub. Soon we were joined by the Canadian family and our new friends from Singapore. After a mix of clouds and stars, we saw the partly cloudy sky over the open Atlantic light up and show hints of possible lights. Soon the clouds dissolved, and the entire sky began to sing with bright ribbons of neon green. All seven of us gazed upward, murmuring and gasping with childlike excitement. At this point, I began to think, “Okay, this is getting unreal. So good, it’s ridiculously over the top!” My friend and I ran out of adjectives trying to describe the events of the day. At every turn, just when you thought it couldn’t get any better, it did. Then right on cue, a meteor shower began. Seriously. The collective response was “Are you kidding me?? ?” Sheer disbelief. Here we were, this little international conglomeration watching the skies literally dance around us, all from the comfort of a hot tub near the Atlantic Ocean. Instructor Gabriel Biderman photographed this stunning time-lapse during a night photography workshop in the Westfjords of Iceland for National Parks at Night in August of 2017. I'm grateful for this video, as none of us had our cameras when the lights began. Thank you, Mr. Biderman! One streak of Northern Lights, less vibrant in color, hung motionless directly over us. We watched it fade away and revive time and time again, while the other lights to the north seemed to compete with one another to steal the show. After about an hour, the overhead light suddenly strengthened in color and vibrancy. It quickly attracted our attention. It began to slither back and forth like a snake in forward motion. Then the bottom half of the light streak sped up its slithering movement, the streak bent in the middle, and the bottom half looked like it would fold up into the top portion. But oh no, it didn’t. Instead, the top half also began to move, and the two sections were swirling and spiraling around, almost chasing each other. The bright green color grew brighter, and the swirling movement sped up so much that it resembled the blades of a fan. All seven of us threw our heads back and screamed. We howled, clapped, cheered and hollered, as this dazzling spiraling display hung directly over our hot tub. Then as quickly as it started, it came to a complete stop and the light streaks dramatically fanned out in five different sections from the epicenter, like fireworks, and faded into nothing. Just like that, it was gone. Well, that was definitely it, I thought. That’s the perfect way to end this day. Not quite. Believe it or not, the day had one last surprise in store. I assumed it was a mistake, but he insisted it was definitely Wisconsin. He said “I lived and studied in the big city there, what’s it’s name? Starts with a M?” It turned out that this young scientist did his senior project at UW Madison for a semester. The subject of his project was, and I kid you not, how to make the scientifically perfect cheese curd. For the uninitiated, cheese curds are an integral part of the Wisconsinite’s identity. They are these strange looking, curdled and knobby creations that are zip-locked into a bag in such a way they could resemble something from a pathology lab. My friend and traveling companion had first seen cheese curds when we were in high school. In 1992, she traveled from her home in Detroit to visit me in Northeast Wisconsin. My father and I were with her in a grocery store when she first spied a bag of them, and in horror she gasped “what is that?? ?” My Dad, clearly amused by her reaction, said “Oh those are cheese curds. When you bite into them, they squeak!” Quite the bizarre thing to say to a 17-year-old non-Wisconsin vegetarian, but it quickly became an endearing memory between my friend and me. My father and me in 1978, back in the early days of my cheese curd indoctrination. That, my friends, was the cherry on top. As I laid in bed later that evening, I stared at the ceiling, trying to comprehend and relive all the many stunning events of the day. It took me forever to fall asleep, as I couldn’t wipe the smile off my face. Everything went right. In fact, everything went perfectly- and my beloved father, he was everywhere. Four years before Dad passed away, 2010. The best, brightest, most beautiful and life-affirming day of my life was the day I took my father’s ashes for a hike in Iceland. A quiet mission of love became a magical, mystical experience. I’m so glad I carried my father with me that day, because I will carry this day in my mind and heart for the rest of my life. Thank you for reading. Wishing you peace and well-being. Forever, Dad. Love you so much. Photo credit: Myself, and my marvelous traveling companion and beloved friend, Aria Kinch.